Start by cooking the chorizo sausage in a large skillet or paellera pan. When the chorizo has browned, remove and set aside. Using a little of the chorizo drippings, stir-fry the shrimp lightly. Make sure to not overcook the shrimp by leaving them in the pan too long. When ready, remove and set aside. Next, add the olive oil to your skillet and sauté the garlic with the diced bell peppers (red, green and yellow.) Then add the rice, fried chorizo and the water. Sprinkle the packages or cubes of yellow rice seasoning over the mixture, along with the salt and pepper. Stir with a wooden spoon, then lower the heat and cover the pan. Let the rice simmer for 20 to 30 minutes. When the mixture is almost finished, add the shrimp and frozen peas. Replace the lid and continue cooking for a few more minutes. Serve hot, accompanied by a fresh green salad. Use precooked rice for better results. If you can’t find yellow rice mix or seasoning in your local supermarket, you can make your own with a pinch of saffron and one cube of chicken bouillon. 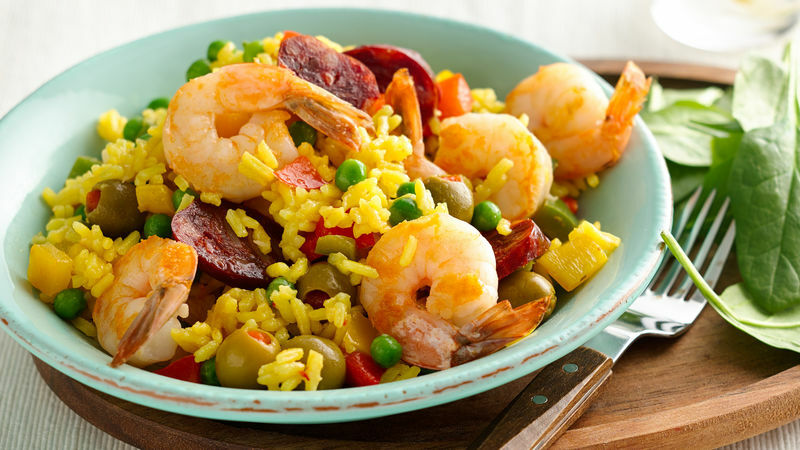 Paella is a dish that brings back many childhood memories; my grandmother would lovingly prepare it and add various ingredients along the way, such as seafood, pork, Spanish chorizo sausage and chicken to emulate the original Valencian paella from Spain. Considering that shrimp are now in season, I want to share a simple recipe with you based on my grandmother’s original creation. Let’s get cooking!